Early Saturday evening, Team Captains met for the last time this week to talk about the course of events surrounding the Downhill discipline on Saturday and receive information on Sunday's programme. One thing was extremely important for all involved parties: FIS representatives and Organizing Committee officials all wished a speedy recovery to the racers who fell during today's discipline, Georg Streitberger, Hannes Reichelt and Aksel Lund Svindal. Afterwards, Michael Huber spoke about the implementation of the race: "Our sport is an outdoor sport - and we have to adapt to the weather. On behalf of the entire Organizing Committee, I thank the Jury for the decisions taken". Huber is now focussing on the scheduled implementation of tomorrow's Slalom. 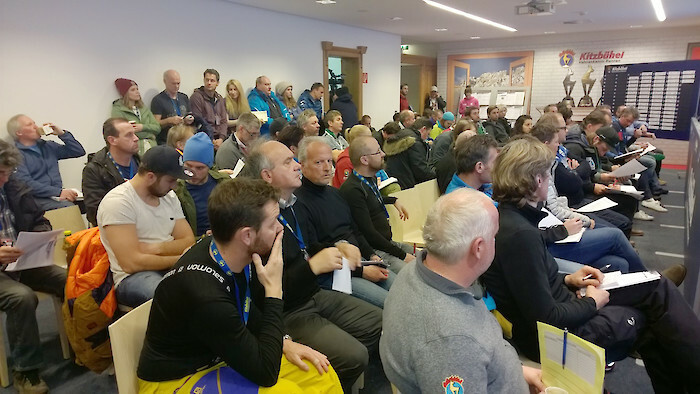 FIS Race Director, Markus Waldner, explained the Jury's decisions in detail. The predicted weather "window" at lunchtime prompted the Jury to postpone the race for an hour. Repositioning of the start-line to start position one, above the Mausefalle, was a joint decision made by all the coaches and made absolutes sense, as wind and visibility were very good at 12:45 hrs, said Waldner. With regards to the athlete's falls, he clarified that he inspected the Hausberg racecourse section personally and the slope was in good condition - the Hausberg is simply a point in the race where the tiniest mistake can lead to a tumble. The decision to stop the race after 31 racers was ultimately made on the recommendation of course setter, Hannes Trinkl, who watched the entire race from the Hausberg. "With the help of explanations by the coaches and TV pictures, experienced racers were able to cope with this challenging passage in diffused light conditions better, explained Trinkl. He could not guarantee, however, that the younger athletes from start number 31 would be able to respond correctly to the difficult conditions. In this respect, the decision to stop the race was made for the safety of the younger and less experienced athletes. Meanwhile, the Programme for Sunday's Slalom was confirmed: the first run starts at 10:30 hrs, the second at 13:30. The weather should stay dry on Sunday - which means there is nothing standing in the way of the 2016 Hahnenkamm Races final discipline.